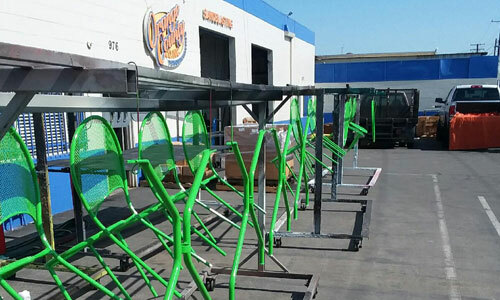 Orange County Powder Coating provides high quality, cost-effective powder coating, sandblasting, bead blasting, and chemical stripping services to commercial businesses throughout Orange County. With over 60 years of combined experience, our staff has the knowledge and expertise to resurface metal signage, window moldings, door frames, storefront material, gutters, aluminum flashing, and more. We can powder coat, sandblast, bead blast, and chemically strip the following aluminum, steel (copper plate and buff), magnesium, stainless steel, pot metal (die cast), brass, and tin. We can also sandblast wood to give it a weathered finish, and offer specialized options such as light and brush sandblasting. Over the six decades we have been in business, we have worked successfully with contractors and engineers across most industries, including top national corporations such as Forever 21, Starbucks, and CD Construction. Only 5% of powder coaters in Orange County have an oven as large as we do. With dimensions of 8' x 8' x 20', our powder coating oven can easily handle almost any size order, even extra large street light poles. We carry an extensive inventory of over 500 premixed powder coating colors, including designer "candy colors." We even offer free samples to help you choose the best color for your project, and can special order any color we don't have in stock at no additional cost. Additionally, unlike many of our competitors, we have our own on-site blasting booths, which means we can complete most jobs without having to send them out to another shop. This keeps costs down and allows us to manage the entire production process from start to finish, ensuring quick delivery of a quality product. Extensive Experience. Honest Advice. Attention to Detail. Expert Workmanship. 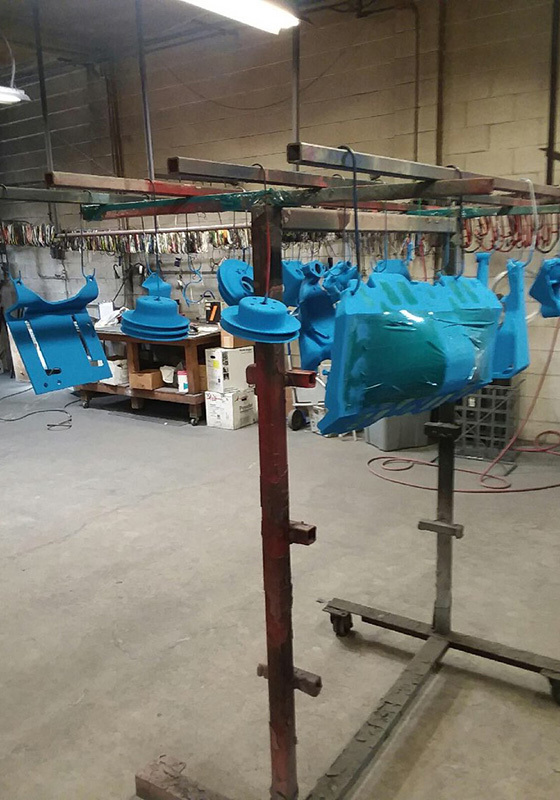 Long-lasting powder coating requires expert preparation, and that's why we always use the industry's best practices when powder coating, sandblasting, or bead blasting. Because of our years of experience, we know how to accurately determine which blasting medium (sand, glass beads, or steel grit), will be most effective for removing dirt, rust, grime, and old paint from any metal item. We carefully monitor all facets of the production process, including abrasive blasting, oven temperature, and cooking times, to ensure a color-fast finish and durable protectant. We also provide cost-effective chemical stripping services. Chemical stripping is perfect for cleaning stubborn paint and old powder coat from motorcycle, automotive, and aircraft parts, military gear, and more. Our chemical stripping services are so safe and effective that we often receive referrals from other powder coating shops that don't have the ability to handle the type of work we do. Call us or visit us today to receive a free consultation and estimate. If necessary, we can visit your work site in Anaheim, Orange, Fullerton Yorba Linda, or other nearby city to perform a more thorough assessment of the required work. We also offer local pick-up and delivery services and same-day emergency requests for an additional fee. No matter the size of your job, you can count on us for excellent customer service and high-quality results. In fact, we are so confident in our workmanship that we offer a "no attitude redo program." If you find something wrong with your order, and we discover that we are at fault, we will redo your order at no cost to you.